Need a break from the daily grind? Need extra encouragement to carve out daily moments with Jesus? Need to hit the pause button and embrace tranquility? What is a good way to invest quiet moments in Scripture, thought, and prayer to help you center your mind and heart on the Source of peace? 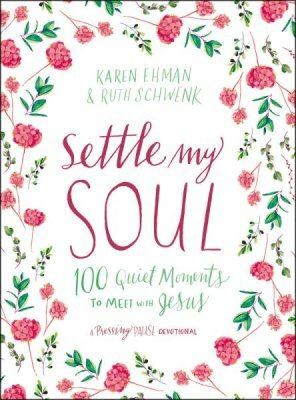 Bible Gateway interviewed Ruth Schwenk (@thebettermom), who, along with Karen Ehman (@karen_ehman), wrote the devotional book, Settle My Soul: 100 Quiet Moments to Meet with Jesus (Zondervan, 2019). What message is the title of the book meant to convey? Ruth Schwenk: There’s a lot in life that pulls at the soul, making us feel restless, anxious, and distracted. The psalmist says, “My soul finds rest in God alone” (Psalm 62:1). I hope the title of the book makes a woman feel like this is an invitation to find rest, real rest, for their soul. It’s an invitation to experience more of God’s love, grace, and truth, which is what our soul desperately needs most. How and why are women today stressed to the max and how is that stress different from the stress previous generations of women experienced? Ruth Schwenk: I think there’s a lot of pressure to be perfect, or at least perform at a high level in everything we do: work, motherhood, marriage, volunteering, spiritually, etc. Not only do women put pressure on themselves to do it all, we live in the social media culture that shows us how everyone else is doing it all too. Now that we can see what everyone else is doing there’s an added pressure to do even more. The reality is that we aren’t meant to do it all. We each have our own unique calling and gifts. How does a devotional book like this contribute to a Christian’s spiritual growth? Ruth Schwenk: We can all really struggle to see how God’s Word applies to our everyday life. Settle My Soul takes everyday struggles and sheds light on how we should respond to them biblically. It’s one way for us to continue to “root our lives in Christ” (Colossians 2:6-7), which in turn, strengthens our faith and faithfulness. Select a devotion from the book and explain why you singled it out. Ruth Schwenk: The devotion “Faith for This Place” is a great reminder for all of us. We ALL struggle with fear at different times and in different seasons of our lives. The challenge, then, is to remember that God is faithful every step of the way. We don’t have to fear what the future holds because God holds the future. Life is full of joy, but it’s also unpredictable and scary. We are in good company when we read the Bible-we find so many stories of God’s people learning to trust Him and moving out in faith, even when fear is lurking close by. And we’re encouraged that God has to keep reminding his people not to be afraid. This is what I love about the Lord’s reminder in Deuteronomy 1:29-31 to the Israelites before entering the land of promise. They too were afraid. They too were wondering, What if God doesn’t come through? They too wrestled with trusting in God’s goodness and faithfulness for the future, though they had seen it with their “very eyes” in the past (v.30). So just as he reminded the Israelites then, he reminds us now-I am going before you. I will fight for you. You’ve seen me do it before; I’ll do it again. Moses reminded them that the Lord had been good and faithful, carrying them like a father carries his son, all the way until they reached “this place” (v.31). Fear lives in the “next place”. Fear lives in next week or next year. It lives down the road, when our kids are out of the house or when we grow old. It robs us of today. Causes us to be forgetful. Yet God wants us to remember that he has been faithful to provide all we need to get us to “this place.” And if he has gotten us to this place, we can be sure he will get us to the next place, where he is present and sufficient. What is making you fearful today? Are you resting in the place God has you, or are you anxious about where he is leading you? Fight fear today with the faith that God’s presence and power are with you. May his peace, the peace that surpasses all understanding, guard your heart and mind from needless worry-because you know your God is near. And you know he is good. 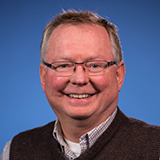 Ruth Schwenk: One of my very favorite Bible verses is John 3:30, “He must become greater, I must become less.” This verse is one that I have held close since I was a new Christian at the age of 16. At that time, I was struggling to follow Jesus completely and it was the reminder I needed that this life isn’t all about me. Over the years, it continues to apply to my life. In all situations, I can hand the reigns over to him. The greater I make him in my life, the more confidently I can face anything. He’s in control, I’m not. Ruth Schwenk: I love Bible Gateway. It seems like an old friend I’ve turned to time and time again when searching and studying Scripture. Settle My Soul is published by HarperCollins Christian Publishing, Inc., the parent company of Bible Gateway. Bio: Ruth Schwenk is the founder of The Better Mom, and along with her husband, Patrick, the creator of For the Family. She is a pastor’s wife, mom of four energetic kids, a lover of coffee, and dreamer of big dreams. She loves leading, speaking, and blogging. 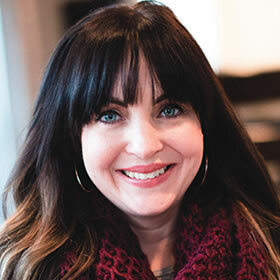 A graduate of Moody Bible Institute, Ruth is the coauthor of Hoodwinked and Pressing Pause. The Schwenks are the coauthors of For Better or for Kids. Ruth, Patrick, and their children live in Ann Arbor, Michigan. Don’t let another moment go by not being a member of Bible Gateway Plus. Get biblically wise and spiritually fit. Try it right now!